Thank you for visiting, great to see you. This is your one stop shop for your trailer needs. We think we have everything covered for you in Trailer and accessory terms but any questions or suggestions we would be pleased to hear from you. Have a look around and if you have any questions just give us a call or drop us a quick email and we will call you back. Welcome to Trailers for Sale Nova Scotia. A division of Dartmouth Surplus. Our objective is to provide, what you are looking for, when you want it and for the best price. Having a quality trailer that will last you many years doing what you need it to do for a good price was our target. This led us to searching for the best Trailer Manufacturer we could find. 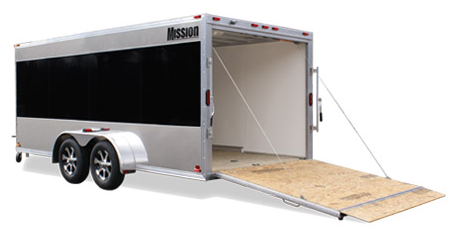 For a comprehensive coverage of possible trailer options we selected Mission Trailers and E-Z Hauler Trailers for their quality, price and rugged design which should be the basis of your choice of trailer. They are constructed from Aluminum which makes them a lot lighter than their steel counterparts to save you money in fuel costs. Being Aluminum they are much less prone to corrosion. With aerodynamic design of the enclosed trailers there are further fuel savings. Hundreds of trailers sold to active people all over Nova Scotia. We know you will be impressed with your new Trailer. Spring Special - with a crazy price deal for Spring only - Just for you. Call TODAY to find out more. 1 902 468 9730 (Shhhh!!! - Keep this quiet as it is a website deal only). Dartmouth Surplus is the Main Dealer for Mission Trailers for Nova Scotia as well as E-Z Hauler Trailers. Because of Distance to the nearest Trailer Dealers across Canada we also provide trailers to Prince Edward Island, New Brunswick and Newfoundland. We have a good range of stock for you to pick up or we can send to you the same day.